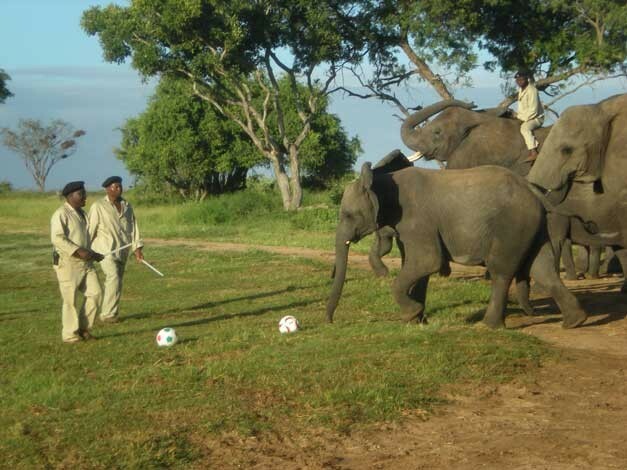 The elephants love playing soccer, and we often arrange friendly games between the herd and the grooms. But while the adults understand that it’s a kicking game, the babies are still convinced that it’s “Aussie rules” football. They’re a lot harder on the soccer balls as a result, because if they’re not stuffing them into their mouths, then they’re standing or diving on the balls to make sure nobody takes their prize. Just like children, the younger members of the herd are not all that keen on sharing. While they’re still learning the rules of the game we give them homemade soccer balls to play with, as they’re a lot hardier than the real ones. The babies are onto us though, they understand that there’s a difference between their homemade balls and the smart store-bought ones. So if the opportunity presents itself, they’ll grab the the adults’ soccer ball with their trunk and make a run for it. We played one of these games last week. Limpopo tried desperately to convince everyone that she was old enough to join in, but eventually she got bored and went off by herself to practice her ball skills. She was doing pretty well until she kicked the ball a little too hard. She was so determined to catch it that she tripped, and quite unceremoniously at that. Poor Limpopo ended up with her rear in the air and her nose in the ground. Fortunately the little girl’s ego was the only thing that got damaged, and once she’d shaken the gravel from her trunk she marched off to nurse her wounds in private. Last week I mentioned how we’d offended Joe’s sensibilities by darting him in the rear when he came to visit. After the unfortunate incident, he left in a huff and that was the last we saw of him. He’d clearly decided that it wasn’t worth visiting us. We were out on safari earlier this week when I heard reports on the radio of an old telephone line that had fallen down in Kapama Nature Reserve. Rangers were saying that an elephant had wandered through the area, and some of the loose copper had gotten tangled around its leg. I wondered if it was Joe, but we were still in the middle of our walk so I couldn’t go and check. There was further talk on the radio, this time saying that the elephant was close to the stables. I then got a call from security officers confirming that Joe was in the area. We arrived back at the stables, and had just taken the saddles off and sent the herd to graze when Joe pitched up trailing a long copper rope behind him. Fortunately his leg was absolutely fine, and we were able to quickly free him. What I found uncanny about the situation is that Joe got to the stables just after we returned from our walk. Whether this was purely coincidence we’ll never know, but I like to believe that Joe timed his arrival to coincide with ours. I think he knew that there was no point in coming any earlier because there wouldn’t have been anybody there to help him. Hopefully helping Joe out of his sticky situation has convinced him to forgive us for our earlier ‘darting’ indiscretion.